By a streak of luck I not only found a nice pair of pants (that I noted, for purchase later this month while in Milan for some Xmas sales shopping at Giorgio Armani HQ), but also happened to be at Giorgio Armani as a special show called Eccentrica was going on on the secret 9th floor of the Ginza megastore building. The exhibit, on it’s last day of a short run, features quite a range of Privé gowns with a very Japanese bent, as well as some quite startling bits of personal decor, like this glass flower arrangement. I don’t think I will ever be a haute couture customer. En route to Japan again, this time for a whistle-stop tour of central Tokyo, leaving snowy Munich airport beneath the wing of a Turkish Airlines flight flying via Istanbul. 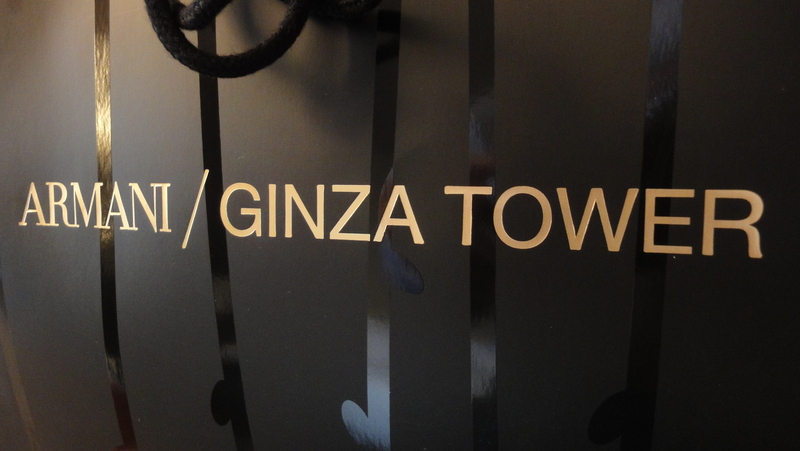 I may get a chance to see the Giorgio Armani stores in Roppongi Hills and Shibuya, but the main target is the Armani multi-brand store visited once before in downtown Ginza; I want to see what Privé is all about and give the store another chance to win me over. The Armani store in Tokyo’s Ginza district is what I would call an Armani megastore, with every sub-brand represented somewhere in the building, including Ristorante, Spa, Emporio and Privé. According to the WSJ, this push to bring all the brands into a common retail platform was some part of a disagreement between Giorgio Armani and one of his most senior and trusted managers, John Hooks, who left his role as Deputy Chairman in 2011 after more than a decade at Armani. So does the megastore concept work? Well, honestly: it does — and it doesn’t. But the entire lifestyle that those clothes are intended to fit – shifted slightly off-key to allow the EA and AJ crowd to enjoy a cocktail or what was described to me by the head host as “fine dining” — shrink-wrapped in a minor city block? No. That seems wrong. This Giorgio Armani customer doesn’t want to shop in a megastore. It seems out of balance — inelegant, in fact, which is counter to what the brand I am buying represents. And I think that leaves me feeling a little disappointed by this experience. The world of high fashion is a seasonal beast, and sometimes it is confusing where you are on the annual style calendar. Right now the boutiques are just starting to stock the Fall/Winter 2012 lines that were promoted back in the January shows in Milan, and I’ve already purchased a couple of nice pieces. Meanwhile in Paris, the Armani Privé Fall/Winter 2012 collection is wowing the collected celebrities. Armani Privé is a subject I will write about again in the future; it’s the top of the top end, but is largely irrelevant for men unless you are a Cate Blanchett fan (I am). This mix of seasons can be quite confusing as what’s actually in the shops bears little relation to what you are currently seeing on the screen. In fact that offset is a little odd; if you think about other commercial organizations, they want you to see something in an advertisement and go and buy it now. But with fashion you have to wait 3-4 months before you can acquire what you saw, if you can even remember what it was. Fashion houses of course are using shows to pre-sell collections to commercial buyers; the movie stars and former models in the front rows are not the target audience for these shows, they are the bait. The big fish are the guys who will order 10,000 pieces for Barney’s, Saks or Niemann Marcus. And of course they need to make those orders in advance of when they will be stocked, so they can be produced and delivered in time for the season. How much of that actually needs to happen when you own all the boutiques yourself, as with Giorgio Armani? In this case it is probably just a marketing exercise, aligning with the industry cycle and getting lots of publicity for the brand, regardless of the season. I can’t say that I have found one specific garment in any publicity and gone looking for that one piece. I’m already a buyer: I just need reminding there is some new stuff out there, time to go and check it out. And that’s what these shows do, remind us to go and look, and find something new to buy.